HAVANA, Cuba - The United States and Cuba on Wednesday began in Washington their second round of regulatory talks, a mechanism to make progress in commercial ties in line with the executive measures of President Barack Obama aimed at modifying the trade embargo imposed on the island. Prensa Latina reported from the US capital that, since the decision of the two governments in December 2014 to begin the process towards normalization of relations, Obama has announced a number of actions that make the embargo more flexible, after recognizing the need to end it. In the light of the complex web of laws and decisions that make up the embargo, Washington and Havana agreed to hold such meetings, the first of which took place in Havana in October, in the context of the trip to Cuba of US Secretary of Commerce Penny Pritzker. The resumption of the regulatory dialogue in Washington is chaired by Pritzker herself and Cuban minister of foreign trade and investment, Rodrigo Malmierca, who is on a working visit of four days until Thursday, heading a delegation of executives and businessmen from the island. According to the hosts, the meetings scheduled through Thursday will allow the Departments of Commerce, Treasury and State to explain the changes announced by Obama last month and the business opportunities for US companies in Cuba in the new scenario. This second dialogue is another opportunity to better understand how the two governments and economies can work together, Pritzker said in a communiqué. On January 26, the Obama administration announced financial measures and on exports and travel, with emphasis on the possibility of granting credits to Cuba. It is expected that the visiting delegation will explain on Wednesday the characteristics of its economy, particularly with regard to the importation of goods and services and financial transactions. “We come humbly to understand each other better and see how to concrete operations can be done,” Malmierca said on Tuesday, when along with his accompanying delegation he was visited the US Chamber of Commerce, where he talked with leaders and businessmen. The minister acknowledged the regulatory measures by Obama, but reiterated that the existence of the embargo is the main obstacle to progress in bilateral ties. Cuba insists that the current US administration can do more by way of executive orders to reduce the impact of the embargo. 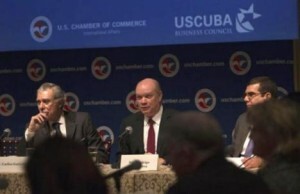 Also, the vice-president for the Americas of the US Chamber of Commerce, Jodi Bond, and former secretary of commerce, Carlos Gutierrez, pointed out the obstacle the embargo represents for bonds between the two nations. Gutierrez, who chairs the US-Cuba Business Council, told Prensa Latina that US companies interested in doing business with the island should demand Congress to end the sanctions, which were made law in 1996. The more companies are interested in Cuba, the more influence will be exercised on Capitol Hill, he underlined.